This scan from a photo from the Bronaugh Methodist Church is of "Mrs. Steinbach." Helen Landis wrote about her GGrandmother - Mahala Wray Steinbach. 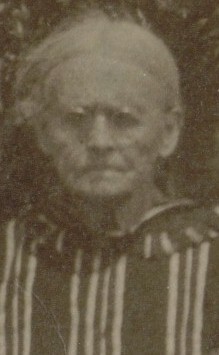 John Wray was Mahala's father and Hester Ann Carter Wray was her mother. Hester died August 31, 1864. John died May 4, 1884 and is buried in Deepwood cemetery in Nevada. Hester was actually buried in Warren County, Missouri. After Hester Ann died John married Caroline Emily Caton - Hester's cousin. The obituary for Mrs. Steinbach appeared in the January 30, 1929 Bronaugh Journal. It shows that Mahaha had been married to John Steinbach and they had had nine children. These included Delia Titus and Hester Pryor of Bronaugh. Regarding the obituary - Mahala was born in Warren County not Jasper Co.Missouri. Helen tells that Henry Steinbach and Sophia Edwards Steinbach came from a town named after the Steinbach family in Germany. On 1860 census it said Sopia was born in Baden, Germany and from census was born in 1802. Henry was probably a couple years or so older. Henry Steinbach and Sophia Edwards Steinbach came to America around 1830. Haven't found when they came over. Have looked for ships manifest etc. and couldn't find. As Henry , I suppose Jr., was born in 1834 . The boys were born near Harrisburg in Cumberland Co., PA and found the family also had lived in Berks Co., PA The other two sons were Andrew born 1840 and John (ggrandfather)1843.but found Sophia and sons in 1860 census in Little Osage. Henry wasn't listed so he must have died earlier. Henry and Sophia are probably either buried at Summer cemetery near Metz or at Rhea cemetery. There aren't any records for either. Just about 3 stones that are recorded at Rhea and it isn't them. I am almost sure that they are buried at Rhea cemetery. Andrew is buried there as well as two of John and Mahala's children. Wm who died as an infant and Lora, as Grandmother referred to as her little sister. Grandmother knows they were buried at Rhea cemetery. Helen found on land records in Nevada that the 3 sons had land together probably on the Little Osage. Henry married Adelaide Osborn in Nevada 1855. They had two children and then when they moved to Bourbon Co., KS where they had two more children. Later they moved to Colorado and then moved to New Mexico territory. Awhile after, Adelaide died in 1900 in New Mexico territory. Henry moved back to Colorado and settled at Silverton, Co. He must have died there as later couldn't find him on any census. He isn't listed at the cemetery there but believe that he is probably buried there. There are graves there that don't have stones to them. There was an epidemic there and think probably died in that as that is around the time couldn't find him anymore. The children moved elsewhere. Helen tells that Mahala was in Washington at the time of her death - staying with her daughter Alice Robinson (of Camas Washington). It was too expensive to ship her body back to Vernon County so Mahala Frances Wray Steinbach was buried near Vancouver, Washington with her daughter Alice Robinson. If you have Steinbach information to share or questions, or if you can confirm some of the above mentioned burials, please let us know.